One frequent comment Cruise Week has heard from cruise execs of late is that they're receiving substantial business from agents who haven't sold much, if any, cruise product before. "We're seeing a broader base of agents selling cruises," one supplier said. He supplied a specific example: "We observed that XYZ Travel suddenly has $100,000 on the books. We research to find who they are and find a home-based business focusing on group travel with Indian ancestry." The trend may be tied to changes in premium cruise line marketing in recent years. The lines are learning that reflecting the ethnic diversity in their source markets can pay off in first-time cruisers. 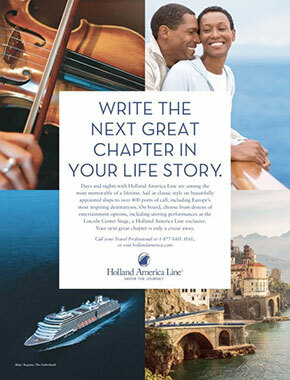 For example, African-Americans are featured prominently in Holland America Line advertising now as well as in the Ocean Medallion ad campaign for Princess. HAL’s partnership with Oprah’s O Magazine is another example – many of the magazine’s readers are affluent people of colour. Another example: Majestic Princess videos being shown to North American agents primarily feature Asian cruisers. With this emphasis on diversity and bringing in those new to cruising, more and more cruise execs are recognizing the importance of travel agents guiding clients to the most appropriate cruise line. If they're on the wrong brand, it's one and done.